SoapLab Malaysia: Should i register my natural handmade products with KKM? 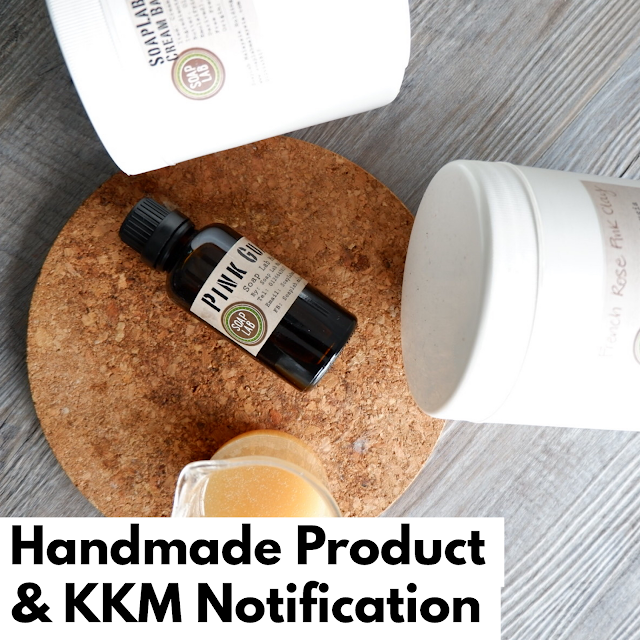 Should i register my natural handmade products with KKM? Hi. Good morning. Heres another question that we get asked a lot so i thought of enlighten you with the answer to this question. First of all let me explain what product notification is and how it works. Product notification is basically you notifiying KKM (kementerian kesihatan malaysia) that you have this one product; and this product is under your company and you are the product owner and you are responsible for everything related to the product. You will have to submit documents to NPRA via quest 3 including manufacturing GMP licence etc. After 2-3 days; once your product documents is sufficient; you will get a notification number. What KKM Notification is not is that its not a number that says the product is safe! Its just saying that you have let the authority know that you are selling this product and if there is any problem related to this product: they know where to find you. product notification doesn’t mean that KKM will do test to ensure the product is safe. That is your duty as a seller to make sure its safe at all times. Its not the same as ‘product registration’ that most pharmaceutical meds needs to undergo (thats a proper intensive 1 year research and lab test done by NPRA to make sure the medicine is safe for public). For cosmetic that is not done. Therefore if you are a responsible seller; you should do your own lab test and analyze the product content yourself (prefabaly every batch/ every quarter just like what we do). Lab test ensures quality; while registering with KKM doesn’t really mean anything (in terms of safety) . Hence the reason if you see many ‘problematic’ skincare thats banned; it mostly has KKM NOTification and yet they have lots of banned ingredients in it. Its because lab test is not done by KKM when you notify. Its not their responsibility to do it; its yours as seller! Thats why its called ‘notification’ and not ‘registration’. So as a handmade cosmetic ‘creator’ make sure that the ingredients you are using are of good quality and safe. Not something thats adulterated. Do i Need To Notify My Product? Having said that; if you are selling your product to public; its a requirement by law to notify your product to NPRA. Since you are making your product handmade; you will need to engage with a GMP company to do the whole notification for you. There are many GMP facilities around in Malaysia and they are willing to do this for you with a fee. Unfortunately its not cheap. Could cost up to RM 5000 per product which i find very hefty for someone who is just starting out. Whats my take on this? For me; the whole reason you make handmade products is because you want to make sure everything is ‘natural’ and ‘safe’. Coupled up with the occassional lab test that you do; the product can be ensured that its safe. But law is law and its an requirement that every cosmetics sold in Malaysia should be notified. My say is; when you start out; start by selling to your friends and family. At this point of time you probably don’t have proper packaging and labeling yet. Get the necessary testimonials and improve your product to a point there its ‘perfect’; and from there; once you think you are ready for the mass market; get your product notified. I’ve had so many clients wanting to ‘notify’ their products even before selling one pc. Yes it is a requirement by law but if you don’t even know you can sell or not; whats the use of notifying? As for ‘safety’ promise to your customers; by notifying it doesn’t show that your product is ‘safe’, its by showing your lab analytical test is what shows its ‘safe’. To be safe when you are getting supplies from your supplier; get the relevent documentation needed. !